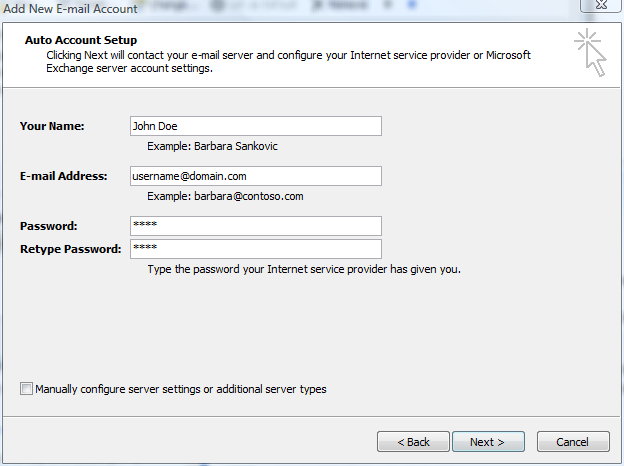 This tutorial will explain the standard setup of Outlook 2007 for use on our servers. 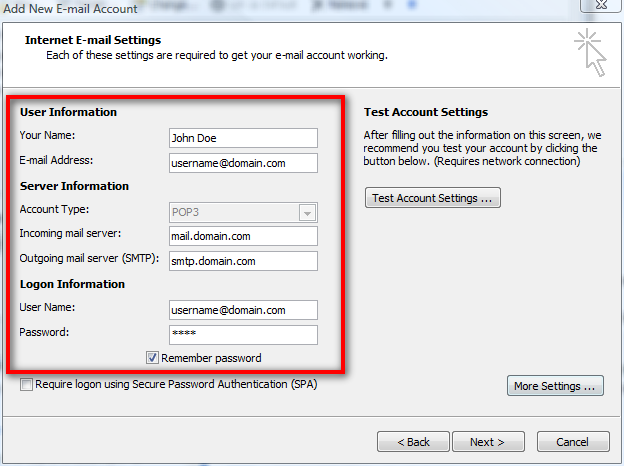 At the Top select "Tools" then "Account Settings"
In the Add New E-mail Account Screen select "Microsoft Exchange, POP3, IMAP, or HTTP and click "Next"
Enter the information as requested on the next screen. Use the image below as a reference remembering to replace the domain name with your actual domain name. Customers who use our Legacy Mail Server may need modified settings. Typically the Username for these users follow the format of domain.user, all other settings remain the same. If you are unsure please contact us for assistance. Select "Manually Configure Server Settings..."
Account Type: Select POP3 if you are not sure. Some accounts also have access to IMAP if needed. If you plan to relay via our servers please select "More Settings" at the bottom and select "My outgoing server requires authentication" under the "Outging Server" tab. Then select OK. If you do not you will not be able to send email unless you specify the SMTP server of your ISP. Click "Test Account Settings" to be sure everything passes. If you get errors when verifying your settings please ensure that you are properly connected to the Internet and that your Anti-Virus or Firewall Software is not blocking access for your email program. Click "Next" then click "Finish"